Sometimes, things are too good to be true. In 2015, we said “Be Sceptical: Mantri Developers offers 100% Assured Returns in 3 Years“. 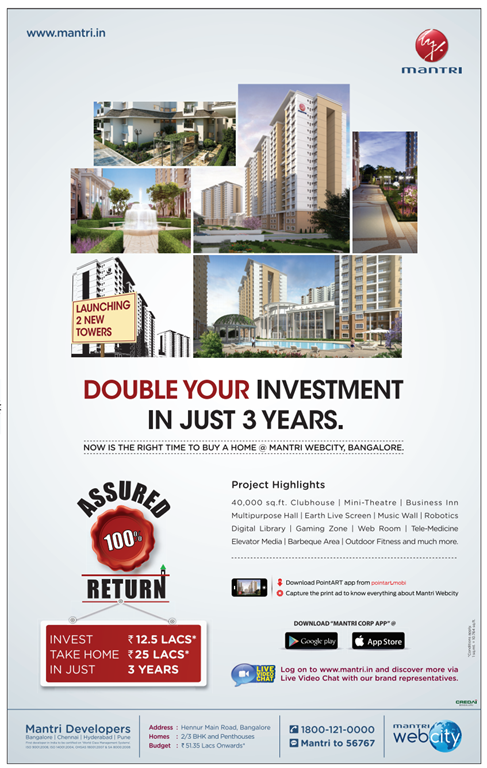 And then in 2014: How is Mantri Realty offering 100% return in Three Years? A large advertisement on a newspaper said that Mantri would help you double your investments. Mantri has to actually pay up. Which it hasn’t, apparently, going by this article: Developer’s promise to buyers falls flat. For many months, Mantri would have paid the EMIs too, giving buyers the false sense of security that the project is perfectly safe. But in the end when they didn’t pay the EMIs, it was left to the buyers – who were effectively the people who took the loan. The bank that provided the loan has the right to recover the loan from the buyer. But at the same time, they gave 100% of the loan amount to Mantri without the project being complete! In effect, they had no real collateral on the loan, which should technically have been disbursed in stages. The bank throught: Hey if Mantri doesn’t pay, the buyer will pay. The buyer thought: Mantri will buy me out at 100% returns. Worst case the bank will recover from Mantri. 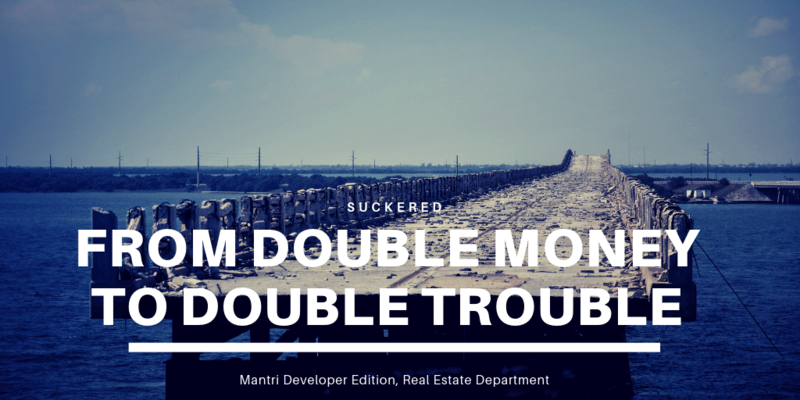 Mantri got the money – there isn’t much need to think beyond that, apparently. Questioning the motives of a “free” lunch is important. Why should Mantri buy you back at 100% profit? Why should a bank give 100% of the money to Mantri when the project isn’t complete? The reward was in the advertisement: 100%. But the risks were just as huge. Yet another promise has been broken, and consumer trust suffers. Never take stuff like this at face value – if you don’t know who the sucker is in a deal (the bank? Mantri? ), it’s probably you. Note for people stuck in this project: One way forward is to take full legal action, including going to NCLT to push for bankruptcy of Mantri if required.